he Emerald Leaf Necklace is yet another symbol jewelry piece of fine art, inspired by the natural beauty of a forest. A large, 14.75 carat Columbian emerald has been carved into the shape of a verdant green leaf and set in 22 karat gold. If you look closely, you’ll see that the veins of the emerald leaf continue into the gold of it’s setting. The necklace is beaded with 56 carats of emerald beads , 6 carats of yellow sapphire and 22 karat gold beads. It took 285 hours to hand craft the gold wok in the Zoein Jewels workshop. Naturally different kinds of leaves, each have a unique symbolic signature and meaning. As you’d imagine, the significants of a leaf is derived in the genus of it’s tree or plant. For example, because of it’s magnificent canopy of leaves and high stature the Oak tree represented nobility and sagacity. So wearing oak leaves was a sign of personal greatness and status. In fact, Merlin of Arthurian lore, was a Druid, which is associated with the Celtic word for Oak. 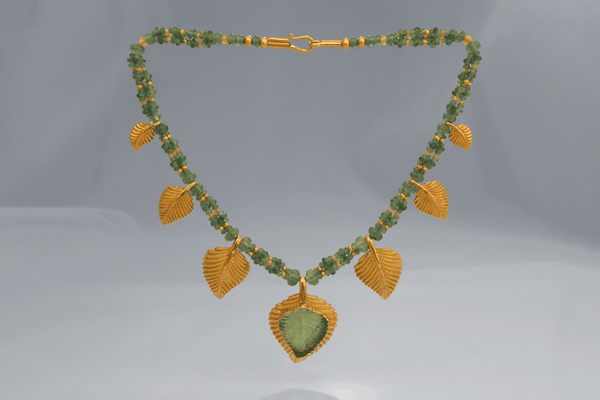 The gold leaves that you see on the Emerald Leaf Necklace are stylized and not associated with any particular genus. In general leaves a tree’s leaves are a living symbol of the cycles of life and transformation. They represent letting go of the past and the birth of new growth; renewal and regeneration. A leaf made from gold, which doesn’t decay, represents that which endures, the archetypesIn this since leave made of gold ar a symbol of the highest purity and even immortality. They are like the genetic patterns that manifest in the mind as thought and knowledge, and pass through the generations. A golden leaf is also suggestive of photosynthesis, of turning light into biological energy, life. It is green foliage of plants that turns the golden light of the sun into living energy. We may understand the rudiments of photosynthesis, but we aren’t even close to being able to replicate the efficiency of the process, which is nearly perfect. Out of 100 photons only .1% of the energy is lost, shed as radiation. The remaining 99% is turned into living matter. As you now know, the Emerald Leaf Necklace is not only a beautiful piece of jewelry, but also a symbolic jewel, and a tribute to the glory of nature and it’s magnificent forests.